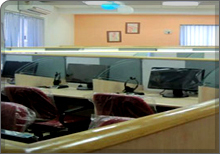 Davies Systems is situated in one of the prime business areas of Chennai with excellently done interiors and facilities. Redundancies are inbuilt at server level, communication lines and for power. State-of-the-art computerization with fully automated call desks. Dedicated and redundant network and telecom connectivity. Multiple Leased optic fiber circuit from India to US, UK, Australia and Europe. Fully redundant voice and data communications with security. Duplicated system to ensure uninterrupted call reception and uninterrupted Internet connectivity. The software's that we use are licensed and they conform to all the data and information security systems. Database systems, which are employed with us, are robust and reliable to ensure integrity and secured data storage, management and retrieval procedures. Equipped with dedicated technology center, which enable us to reduce redundancies with regard to power and storage capacities. Hardware facilities are kept at high availability and scalability to handle large voluminous transactions with simplicity and ease. Davies Systems guarantees a 100% of Data of the Client and the Customer Data’s. Our office is a paper free environment and our premise is facilitated with the Surveillance Cameras, Access Control, Servers with Data Encryption Software’s and the Security Guards.